UK /France/ Spain, 2016, 97 minutes, Colour. Antonio Banderas, Golshifteh Farahani, Clement Sibony, Rupert Everett, Nicholas Farrell, Irene Escalar, Allegra Allen. This is the story of Spanish cave paintings which were discovered in northern Spain in the latter part of the 19th century, at Altamira. The film is a French Spanish coproduction with Antonio Banderas in the lead for a Spanish audience. Spanish locations were used for the filming, the village of Altamira, the surrounding mountains and caves. However, the director is British, Hugh Hudson, best known for his Oscar-winning Chariots of Fire. There is an international supporting cast with the British Nicholas Farrell as well as Rupert Everett as a smug monsignor in the town. While the film does describe the finding of the caves and the paintings, the initial set up is a contrast between the 19th century attitude of scientists, especially after Darwin, and the proclamation of the superiority of science contrasting with the stances of the church, the status of the Scriptures as regards creation and evolution. A pre-credit sequence shows the scientist standing at his lectern on one side of the screen, the monsignor in his pulpit on the other. 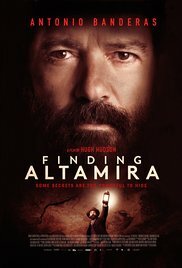 Antonio Banderas portrays Marcelino, the local grandee, benign patriarch of the family, especially with love of his daughter who is intelligent and shares her father’s enquiries and studies, even to the finding of the paintings as she stumbles around the newly-iscovered caves with a lantern. The family expect that the scientific world will be amazed at the discovery and its contribution to Palaeolithic studies. Even the King visits the caves and is impressed. However, a local scientist is jealous, the local monsignor is aggressively antipathetic and what was meant to be a gala occasion at a congress in Lisbon turns into a condemnation of forgery, of disbelief, and of personal condemnation of Marcelino himself. For dramatic satisfaction, Marcelino’s wife, rather tentative in her knowledge of science and support of her husband, goes to the monsignor to confession and roundly denounces him. The film ends 20 years later, with the discovery of the caves and the paintings in the Dordogne in France, the scientist who had denounced Marcelino finally coming to Spain, witnessing the paintings and, belatedly, because Marcelino is long dead, writing an article and issuing an apology. The film is of particular interest to a Spanish audience and their knowledge of the caves and the paintings – and the film can be seen in companionship with Werner Herzog’s 3-D documentary on the French cave paintings, Cave of Forgotten Dreams. 1. The title? The cave paintings and their discovery in the 19th century? The initial response, accusations of forgery, ultimate vindication? 2. Audience knowledge about the caves and the paintings? For Spanish audiences? The cast and Antonio Banderas? The world audiences? 3. The period, Spain, costumes and decor the town, homes, the church, the countryside, the hills, the caves, the interiors? The musical score? 4. The introduction, the opening stance and words of the scientist, the supremacy of science? The counteraction with the words of the priest, anti-science, the word of God? The arrogance of both representatives? The touch of the sanctimonious in each? 5. Marcelino, the family, Conchita and his love for her, Maria? Work, the amateur scientist, his interest in anthropology and Palaeolithic science? Maria, an intelligent little girl, her interest, her enquiries? Conchita and her tending to be apprehensive? 6. Marcelino, the caves, his farm assistant, opening the cave, Maria going in, the lantern, falling, finding the paintings? The claims about them? Marcelino and his good friend Nicholas Farrell? Continued support? 7. Local hostility, the jealous scientist and continued denunciations? Seeing Maria returning from the caves, with the police and the paint? The King, hearing of the caves and the paintings, his official visit, the tribute to Marcelino, friendliness – and snubbing the jealous scientist? The hostile and condescending is? 8. Marcelino Farrell, going to the meeting in Lisbon, the presentation of the findings, denunciations, humiliation, accusations of forgery? The fact that there was no soot on the roof of the caves – and the later sequence with the cook, the particular oil being used and its not creating soot? 9. Marcelino humiliated, the newspaper articles, the priest and his article, that he was not a fit father? Conchita, going to the church, confession, her as a denunciation of the priest and speaking directly to him? His reaction? 10. 20 years later, the finding of the cave paintings in France, in the Dordogne? 11. The visit of the sceptical scientist who had denounced Marcelino, his wanting to make an apology, Marcelino dead, going to the term, some retrieval of honour? The scientist and his apology in his article? 12. 19th century science, 19th century and its attitude towards the Bible? The post-Darwinian era? Science, evolution, palaeontology and the existence of cave paintings from thousands of years?